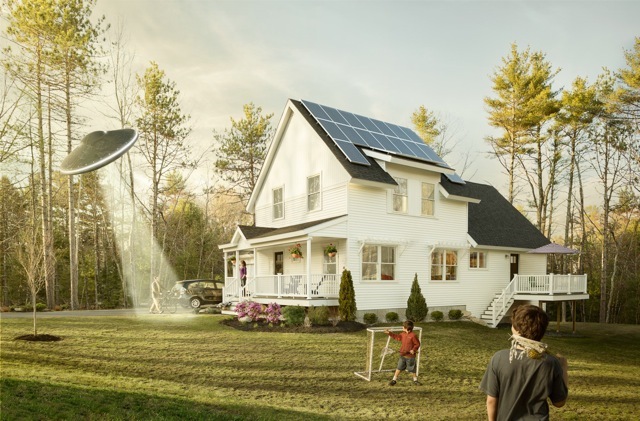 A net-zero three-bedroom house that could be built for $325,000. This prototype design was created by Chris Briley of Briburn and Chris Corson of EcoCor. 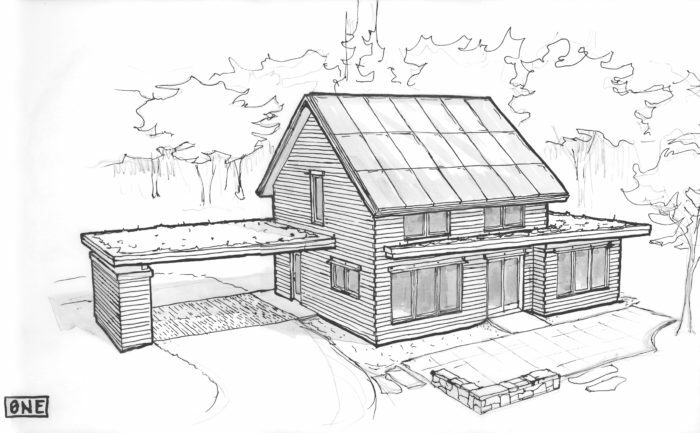 The prototype follows Universal Design principles and aims to meet the Passivhaus standard. Image Credit: Chris Briley They do exist! If operated by careful homeowners, designs from Bright Built Homes can achieve net-zero energy use. The homes are in production and available now. Part Two of this episode brings us to construction details for high-performance affordable homes. Again, I feel the need to point out that we are not talking about low-income housing or housing that makes a difference between shelter and non-shelter. I’m talking about high-performance homes that will compete, on a financial level, with those cheap vinyl boxes that litter suburbia and urban areas alike. Phil and I have refreshed our drinks and are ready to talk about building envelope construction from the bottom up. Let’s get started. Foundation: Can we get rid of the basement? Frost-protected slabs seem to be the best bang for the buck in a high-performance market. In a less demanding market, a frost wall and isolated slab would be a good choice. Walls: Double-stud walls seem to be a strong choice. Dense-packed cellulose, possibly the greenest insulation, is also quite affordable from a material standpoint. The Larsen truss method is also effective with the right builder. Panelization could also be a cost-effective option. Roof: Keep it simple. Remember that hips, dormers, and multiple profiles and pitches are costly. Simple, flat-bottomed trusses are hard to beat from a cost perspective. Windows: Sorry, but you might not be able to afford those awesome triple-pane European windows. Maybe if you’re willing to go with vinyl, and be frugal with your window quantity and operation, you can. Aesthetics: A home is not going to be very sustainable if people want to knock it down from day one. All these cost-saving measures are going to push you toward making a home that looks like a double-wide or a shoe box. Proper proportions, window placement, roof pitch, and treatment of exterior features and landscaping can make an incredible difference. Figure out how to do more with less and keep the details simple. — you’ll never miss a show, and it’s free! We end the episode with some shameless plugging of our own work. Then, of course, Phil takes us out with a new tune that we should be listening to in the studio. It’s ‘I won’t fall apart on you tonight’ by Eleanor Friedberger. Chris: Hey, welcome back everybody. This is the Green Architects’ Lounge. Making Green Affordable, or something like that. We’ll name it Part 2, or the second half. How are you doing, Phil? Phil: I’m doing great, Chris. Chris: You haven’t changed a bit. Phil: I did get a little gray just in the last summer. Chris: Dude, that happens hourly. Hourly. Chris: Yeah. I’m going fast. Chris: Yeah, I’m going blond. Phil: That hit you pretty early on, didn’t it? Phil: Nothing you can do about that, sorry. Phil: Well, that skirt and blouse you have on are really lovely. Chris: They match my eyes. We were talking about “making green affordable” with a high-performance house, and we started with all the “big picture” ideas. Now let’s get into the nitty- gritty. Phil: That’s right. Let’s talk about the wall section. Chris: Alright. Let’s do that. Phil: How about from the ground up? Chris: That’s a good way to do it. Phil: Let’s talk about the slab. One of the things that we didn’t go into in detail is: What kind of foundation, firstly? Because that dictates what our wall section is, really. Phil: We are. Which is interesting, because often the basement is really affordable square footage. Phil: Well, with an energy-efficient house, you’re probably the kind of person who is open to that conversation. Living with less. Chris: Right. I think I saw a New York Times article about a family who had a kid that just had one toy; the kid was only allowed one toy. I’m serious. Phil: Were they trying to torture the poor kid? Chris: Well, they lived their whole life that way, where there’s just one of something. Chris: Restraint. But, anyway, we were talking about the basement. Mechanicals: we can move them up. Think of all the problems that you can solve in terms of water issues and drainage and things like that. Phil: Right. And I’ll say, the only way to get a dry basement in New England is to not have one. Chris: Pretty much. And you can do a lot better job insulating, I think, with a slab-on-grade house. Phil: Right. So, frost-protected slabs. We’re definitely doing more of those. Chris: Same here. That’s definitely the trend. Phil: It tends to be more affordable, for sure. You have to dig less. There’s less concrete. Less resources. Chris: Right. So, if you have a builder who’s comfortable with that – either comfortable learning that, and not passing on the paying for that learning curve onto your client – then that’s acceptable. But, if you have a builder who’s done that, and mastered that, that’s an asset. Phil: And if it’s a frost wall foundation, it’s not the end of the world. It is easy and quick and really predictable. Chris: And all the guys know how to do it. Phil: That’s right. And sometimes the soils will demand that you need that anyway. Chris: And again, we should – at this point – point out where you and I are: we’re in Maine, so we’re used to the northern climate. I think this is less of an issue down South, where slab-on-grade is way more common. It’s probably status quo down there. Phil: And with the soils – I mean, when I was practicing out in Colorado, the caissons were a regular thing. Chris: Wow! I thought our soil sucked. Phil: Yeah. It’s not unusual depending on where you are. And, you know how to insulate those, Chris? Chris: Like in Indiana, where I went to school – go Ball State! – they would pour slabs. They’re not even frost protecting. It’s just sand. It’s so homogenous out there – the soils – that they just don’t get the heaves, the frost heaves, like we get here. I mean, there are roads in our neighborhood, Phil, in our collective neighborhood, that will throw your car off the road if you’re going too fast. Phil: North Dakota, for sure. So, how much insulation – what does it look like, Chris – if we’re talking about doing an affordable frost-protected slab? Where do we start? Chris: You put your insulation underneath the slab. You’re down there; you’ve got one shot at doing this. We’ve said this many times before, about slabs: If you’re not insulating, then shame on you. Really. You deserve a little bit of a spanking. Phil: Oh yeah, it’s a tremendous mistake. Chris: Right. Someone in the future would say, “Why did these idiots – idiots! – not put any insulation down underneath here? What a problem! Phil: Well, I will tell you that our energy models are not showing a huge gain in going from two to four inches. Phil: Yeah. Not tremendous. But, enough that we should do it. Again, like you said, it’s pretty easy and we do it anyway across the board. If you’re going to do two, just do four. Chris: Right. Because you’re there. And you get one shot at it. Are you going to end up, you know, doing the 12 inches that we see in Passive Houses and near-net-zero’s on an affordable house? I mean, if you’re going great-guns affordable, you’re probably not. It’s probably not, bang for the buck, where it’s going to go. You’re going to get a darn good house with 4 inches of rigid under there. In fact, maybe it’s a good time to point out the 10-20-40-60 rule. Phil: Right. This is a Building Science Corporation rule of thumb. Chris: It’s a rule of thumb that I think has really taken off and has real teeth and real meaning and building science behind it. And, you don’t have to take it from us, you can go tothe Building Science Corporation website, which is full of… At first glance, you think “there’s not much here,” and then you start clicking and you’re like, “Holy cow!” And it’ll blow your brains. Phil: So, essentially it’s R-10 sub-slab; R-20 foundation walls; R-40 above-grade walls; and R-60 roof. Chris: No, I wasn’t there, but go ahead. Phil: He said, “You know what, guys? This is not an absolute rule; this is a general idea that’s pretty good. Could it be 11-19-41-58? Yeah, it could.” But, he’s saying that you keep going, even, before you reach diminishing returns. So, it could be more and you’ll be okay. It’s a good guide. Chris: Anecdotally, I know (in our office), that 10-20-40-60 really pans out. I mean: as hitting that sweet spot that we’re always looking for in terms of energy efficiency and getting that demand down. That’s usually right about where we start being able to bring down the mechanicals to a cheaper system. Phil: That’s true. I sort of – again, regardless of what Mr. Straube said – feel like I’ve failed if I don’t hit those numbers on an affordable system. Chris: Yeah. Exactly. But you and I, we’re in a different place than a lot of people in this country. Phil: That’s right. $175/square foot, again, is not affordable for some people. Chris: Right. But this is why: we’re talking about R-values like this. Phil: Yeah. What about the walls? Now, there’s a couple of different ways to do walls. We’ve talked about wall systems. Chris: There are. You’re talking about getting an R-40 wall… right? Chris: I know, one of the most affordable ways for us to do that is the double-stud wall. Are you finding that? Phil: Absolutely. Without a doubt. I think we know it’s not the best wall – it’s not the wall with the least amount of risk – but if you do it right, it’s fine. The wall is fine. Chris: That was well put. It doesn’t have the least amount of risk, and I’d say there’s more work in terms of air-sealing that than some of these other systems. Phil: Yes. It’s very builder-friendly, and cellulose does not cost much money. Cellulose is pretty cheap. Chris: Exactly. Right. You’ve got to get it on site. And you’ve got to get someone to staple up the skin of it. But whether it’s 4 inches thick or 12 inches thick, all that, that I just mentioned is exactly the same. Phil: That’s right. So, if somebody give you a high number for a double-stud wall, ask them to pick it apart. Find out what that insulation number is. Phil: Or do all the math. Count bags. Phil: It’s really what they do. Chris: A lot of times, that’s how they ensure they’ve got the right density. They know the volume of the wall and if they can get all these things in there, then they’ve done it. It’s not that scientific, but that’s how – a lot of times – it gets done in the field. So, other systems: you can do a REMOTE or PERSIST installation: an “out-sulation” wall. You can have your 2×4 stud wall, your sheathing, and then four inches of polyiso foil-faced foam. And that’s a great system that allows everything inside – the electrical, the plumbing (have at it!) – and you’re not going to mess up your vapor barrier and your air sealing. Phil: And you can’t reach dew point within that wall. But here’s “the more:” it’s more thinking. Chris: It’s more thinking. You’ve got window bucks now. It’s not business-as-usual for regular Joe-Schmoe Builder. But then, we’re not looking for those guys. Phil: So, you’d be okay if you didn’t go with that system. Chris: And there’s the Larsen truss method, which is very similar: you’ve got a 2×4 wall or something like that and you’re fastening trusses to the outside of your sheathing that are hanging off your wall, and that’s where you do your insulation, often times cellulose. Or they could be I-joists. Or you could be framing with I-joists. That’s what the Passivhaus, Katrin Klingenberg and Ecolab… that’s what they do. Phil: Pretty cool system, but I question the affordability unless you’ve done it multiple times and you’ve got it down. Chris: Exactly. Now let’s talk about panelization. Right? Start looking around your areas. We’ve got a couple of places here that will panelize walls. If your walls are truly that simple, talk to those companies about panelizing your walls and all of a sudden, you might be like, “Wow! We just saved four grand on this project by panelizing,” and there might be some labor savings. Phil: Possibly. I would say the savings would come in labor and speed. Chris: Right. And there’s a waste reduction. There’s also SIPs. You know, that’s a roll of the dice as to whether or not that’s really going to be the affordable way. I doubt it is. Phil: There’s a lot more coordination. Chris: There’s plenty of coordination and it is a lot of material costs, so… we’ll look into that. Phil: Well, the bottom line of this is that you can’t do it alone as the designer. Regardless of what you’re talking about: any of these sections, anything from Part One of this podcast to what we’re talking about right now, you need the builder as part of the conversation from Day One. You’re not going to hit affordable numbers because you’re not in charge of the numbers. Chris: Right. You’re not building it, Mr. Architect. Phil: So, you need to actually take a pass at it. Or not even. But the builder will be part of the design. And learn your place. Learn when to shut up and let him tell you what needs to be done, because you’re not going to get there. Chris: Well, to a point. Chris: Right. At some point. And right, that’s another good point: you’re probably not going out to bid with this job. I mean, you think that’s going to give you the most competitive bid – the most competitive price – but you need to know before you get to that point with your client, most likely. I mean, am I wrong there, Phil? Phil: No, not at all. It’s the best way to control costs. Chris: Alright. Well, let’s move on up to your rafters. Phil: Yeah, let’s talk about the roof here. Phil: Create a gusset system. Chris: Exactly. Gusset-out some 2x2s. Phil: That works great. We’ve done that a number of times. And then you get your R-60. Chris: Or maybe you’re putting the insulation right on the roof. That’s rigid insulation. But I’m not sure that’s going to be the most affordable. Phil: Again, I agree with you. We haven’t found that to be the most affordable, either. That’s more. And it’s more thinking. Chris: More thinking, and more costly materials. It might be more bulletproof from a vapor standpoint, but… there you go. Phil: So, the next option is: what if you had trusses? Chris: Oh yeah, let’s talk about making it complicated! If you’ve got a whole bunch of different rafters and they seat all differently and you’ve got all different kinds of hangers and then you’re doing hips and valleys and what-not… Your cost is going up. What if that roof is super-simple? What if it’s one-truss profile repeated? Chris: Two roof planes. And what if, Phil, what about cathedral ceilings? Chris: They kind of are. Maybe you’re doing one mono-pitch truss; maybe it’s not as boring, maybe it’s not perfectly flat inside. But honestly, there’s very little that’s cheaper than doing a trussed roof with a flat insulation plane and a flat ceiling. Phil: That’s right. You air-seal underneath your insulation. Chris: You’re fluffing it on. You’re not even doing the dense-pack stuff. You’re just fluffing it on. Phil: And then you’ll see how inexpensive this stuff really is. It doesn’t cost you much. So that, I think, is the most affordable way to go. Chris: Do you want to talk about windows? Penetrations? Things like that? Chris: Alright. You made a good point in the last one, or one of us did, about the number of doors you have, and the entrance doors. Phil: That’s right. Show restraint. How many doors do you really need? Can you get one door in and out of this building? Really! How many ways do you need to get in? Maybe you need a back door. You definitely don’t need more than two. You’ve got to show some serious restraint, and just say, “Forget it.” And they’re not going to be French doors. They’re not going to be sliders. They’re going to be a single door that opens to the interior. Or it opens to the exterior: you actually create a tighter seal, because the wind will close the door against the gaskets. But those are the only kinds of doors that you’ll do. Chris: Now, for the window: Are we doing our awesome Intus triple-pane European windows? Maybe. Chris: If you’re in the territory of aggressive affordability, you’re probably not. Phil: The lowest-hanging fruit is the walls. There’s a lot more wall surface area than there is glass. Chris: Right. But still, your responsibility as the architect, here… you’re still looking for good bang for the buck, for the performance. Maybe you are saying, “Fine. I’ll do vinyl.” I’m not a fan of vinyl. Ugh! But maybe you’ve traded vinyl for triple-pane, if the triple-pane’s affordable. Or maybe you trade it for a high-performance dual-pane. Phil: That’s right. You’re going to have to make trade-offs when you’re doing an affordable house. And you’ve got to figure out where you want those trade-offs. Chris: That’s right. It’s managed sacrifice. It’s needs versus desires. And, Phil, not every window has to open… does it? Phil: Not at all. We’re really spoiled. We think, “Boy! Wouldn’t it be great if…” But we know the performance goes down. Also, the larger panes of glass are going to do better than lots of smaller ones. Chris: Yeah, that’s true. And, if you can minimize well-placed windows for proper ventilation. Like always, put the glazing on the south where it’s working for you – not on the north where it’s not. And be smart about your glazing. Phil: And you’ll find some more typical windows that have high solar-heat-gain coefficient that you can place on the south that can be dual-pane. Chris: Window companies are getting better. I think it’s finally happening. We’re seeing American companies offering regional glazing, which is a really refreshing thing to see. Don’t just pick out your windows. Don’t go to Home Depot and pick out your windows. I’m not slamming Home Depot, I’m just saying, look at these… shop it around. That’s what I’m saying. And look at what you’re getting for performance. Phil: Well, we’ve talked about this before, Chris: we’ve got to do another windows episode. That was our very first one. Phil: That’s right. Windows was second. Chris: So, we’re going to redo those, both of those. Chris: And we’ve slapped some big openings on the south, and one door. Phil: Yeah, that’s right. And nothing on the north. And a flat site. Chris: But let’s talk about amenities, things that always… Porches. Stoops. Phil: Garages. A carport! If you can’t afford a garage – a small carport, where you can expose some structure…? Chris: They can actually look better – to my eye – a lot of car ports can, if done well. Phil: I absolutely agree. Because you get used to seeing two big garage doors that are not going to be nice garage doors, because you don’t have the money for it. Chris: Or maybe, if there is a garage, then that workshop that was in the basement is actually in the garage, so something like that. Phil: Or don’t spend your money on the garage. Chris: Right. And let’s talk about proportions. And it’s a hard thing – you’ve got to go to school to get a real… Pick up Andrea Palladio. I’m not thrilled with most of his architecture, but he gets proportions. Put a human in your drawings to really get a sense of scale. I’ve seen some really ugly stuff and – hey, Architect, it’s going to be up to you. So, Phil, what advice would you give me as I’m showing you my work: “Look at this box I just drew.” What are your rules of thumb, if you have any? Phil: The big ones to me are: window composition. The way the windows get put together is such a big part of making something out of nothing, in a lots of ways. There are a lot of things we can vary with the windows. We can vary the head heights of the windows; vary the size of the windows. We’ve talked about a big fixed glass and maybe a small accompaniment. We could go to the corners – with a lot of things that architects like to do – we like to move the windows to the corners. (“An architect was here!”). But it adds a little spice, a little interest, rather than just scattering one type of window across the face of this thing with even spaces. Chris: Right. You’ve seen those houses, you drive by and you say, “Woah!” Maybe they had a builder, maybe this is a do-it-yourselfer – it’s sort of a proportion and a placement thing. And not every window has to open, right, Phil? windows, it’s nice if they all open, but you could save some money by having three open, or two. Phil: And then you could get one really big window that’s fixed. And that’s going to be more affordable, actually, in terms of cost per square foot. Chris: That’s right. Windows are a place where you may be really doing some of that controlled sacrifice we had talked about. Are you going to do the Intus triple-pane, European tilt-turn? Phil: Right. Maybe you’re not. Phil: Right. And you have to make a decision. There’s more wall than window. You’d rather have that R-40 wall and save double-glazed windows with pretty good solar heat gain coefficient. Phil: Yeah, who else? There aren’t too many. Chris: …for starting to listen to a lot of designers out there. Selling to different climates is a great thing. So, don’t just walk into Lowes or Home Depot and pick up your window and say, “That’s the one.” Look at those numbers. Are you in a cold climate? You’ll want that solar heat gain coefficient. If you’re in the South, and you’re in a hot climate, then you don’t. You know? You want that to be much less. Phil: That’s right. If you’re here listening to this, then you should know that. And if not, consider yourself yelled at. Chris: Right. Go look at a great blog about windows. Don’t listen to our previous podcast on windows. We’re going to redo that one. Phil: The information was okay. Chris: It was, but man, it was dated – because it was pre-European tilt-turn window; it was right when that was happening… the Revolution, we can call it. Phil: You know, Chris, one of the things that I can always look at and say, “Boy! This is an affordable house,” because it looks cheap: the roof; the roof pitch. I mean, if you’re a builder and you say, “You know what? A 6:12 truss is going to be the cheapest way to do it,” please resist. Chris: Or even a 4. Phil: Yeah. It’s the worst thing you can do. Chris: Right. Keep that character. I would agree. Because it might be, you’re paying a little bit more in materials for the envelope – but probably not that much when you price it out – for the aesthetics that you get. What else, Phil? Phil: Simple details. Exterior and interior. Chris: Right. On the interior: Does everything have to be trimmed out? No, it doesn’t. In fact, you can do some really clean details. Go for the clean, crisp, elegant look. That can really go a long way. Maybe you have sheetrock returns, right? Phil: right. And sometimes there’s a pushback because you want a more traditional home, but you have to decide your priorities. You know, it’s a good idea to start with a list of your priorities at the outset, and then you’ll decide what you want to do. What’s more important: that you don’t have vinyl siding; that you don’t have triple-glazed windows? Chris: Right. Because in an affordable house, that’s what it’s all about. What is sacrifice? What is a need? What is a desire? And that is a real process that you go through every step of the way. Phil: That’s right. And the foundation is poured two and a half feet above the ground because it was easier to build that way, and then you’ve got this swath of concrete around the base. And it really looks like it just landed there. Phil: And think about landscaping. That’s something you can do with your own hands. Don’t neglect that. Chris: Right! I think that pretty well does it. I think we’ve spent enough time on making green affordable. I don’t have any Hot Zigs. Phil: We’ll double-zig next time, Chris. Phil: Well, my Six-Digit Idea is how to make a living designing affordable green homes. Chris: Right. That is a Six-Digit Idea. Hey, while we’re at it, speaking of making a living from affordable homes, why don’t you take this opportunity – because you’re not going to plug yourself, so do it. You’re on the cutting edge here, trying to do some modular, affordable green homes exactly like the ones we’re talking about, and that’s one of the impetuses for this podcast. So, plug it, man. What’s going on with you? Phil: So, it’s our new initiative. It’s a side-project for Kaplan Thompson Architects. It’s called BrightBuilt Homes, and it’s (what’s the opposite of predecessor?) the progenitor of the BrightBuilt barn, our first net-zero project. It’s a series of modular homes that we’ve created (right now, we have nine homes). We also do custom, and we’re working with a local modular builder and we’re starting to talk to modular builders in different parts of the country to produce these homes. It’s a system that really hones in on a lot of the things we’ve been talking about: the affordable, simple, modular, built-fast… And we’re hitting anywhere from $175- to as low as $135/square foot for true net-zero homes. Chris: And that’s a big deal. Phil: So, maybe we can make the six digits with those. We’ll see. Chris: Well, I hope you do make at least five. Phil: Well Chris, I just happened to see a really pretty thing on the board in your office. Tell us about that. Chris: Well, you guys can skip ahead of you don’t care much. Phil: It looks really great. It’s a perfect idea. Phil: That’s huge! I mean, it’s beautiful; it looks great. It’s on the mark; it’s very elemental. Chris: Like any great idea, it starts with, “Step one: I find an investor!” I find a bank; I get a loan. Ah, anyway… So there’s another shameless plug. Phil: That’s okay. That’s why they’re Six-Digit Ideas. Tthey’re not completely there yet. Chris: Yeah, that one’s maybe a four-digit idea… Well, we’ll see. In the article it stated, "Sorry, but you might not be able to afford those awesome triple-pane European windows. Maybe if you're willing to go with vinyl, and be frugal with your window quantity and operation, you can." There is truth to that statement. I believe one would be pleasantly surprised if they got quotes from vinyl/uPVC companies like Intus, that they would see that high performing triple pane windows are not always at high prices. As a matter of fact, when doing bids one will find that many US built vinyl double pane windows sometimes cost more than the European built. In addition, the performance numbers from US made (R2/R3) vs. European made (R7/R8) like Intus, better air sealing (< 0.03 cfm²), with the additional robust German hardware and quality, make the decision to go Euro even easier. There is a reason why so many Passive House and high-energy build homes featured here on GBA and elsewhere have gone with triple pane Intus uPVC windows. I for one would never buy a US made vinyl window as the difference in quality and performance between a European made vinyl window and US made vinyl window is night and day. So the article comment is correct, if one does a little research and shops around, they can afford and buy triple pane European made PVC windows like Intus for a great price. Of course if someone wants wood framed windows with aluminum cladding, which increases the budget for both double pane and triple pane windows. It all comes back down to preferences. I would rather spend the money getting better performing triple pane PVC windows than getting double pane windows that don't perform as well but have wood framing. If you can afford triple pane wood/aluminum clad windows, then they have that option available also. Peter, I completely agree and hope it came across clearly in our podcast. If I had to choose between a vinyl triple-pane high performing window, and aluminium-clad wood double pane, I'd go with the triple pane, especially if it's a European tilt-turn. I suspect that the optimal choice of a slab vs basement would depend on the building site. In the midwest, where typically the site is flat, you can argue that a slab is best. In the northeast, where so often the site is on a hill, you have to weigh the cost and appearance of dirt and rock pushed around to create a flat site for a slab vs just pouring a 2.5-sided foundation wall, pushing a lot less dirt up against those walls, and framing the rest of the lower building level. Then you put your utilities and "stuff" in the uphill side of the lower level (with no windows), and you have the remaining perhaps 2/3 of the lower level for living space, complete with windows. Agreed, a basement on a level site is a hole in the ground that nature and gravity want to fill with ground water. But a house foundation built on a hillside is pretty easy to drain to downhill daylight. A walkout basement built on a hillside isn't all that hard to keep dry. That is an important point about research and study. I would even go so far as to say that it is the most important factor in the entire home building project; the research phase. One can spend a year or two just researching and studying the different techniques, methods, materials, etc, needed to complete a green energy build. We, the green building community are still in a small minority, at least here in the USA. Our methodology is unorthodox to the average builder. I walked into a model home just an hour ago and asked the attendant what kind of insulation they used in the walls and roof area. She had no idea, all she did was tell me that the home has CFL's and showed me a binder with options for granite counter tops, carpet and tile. This is the mindset of 95% of the general public here in the USA. Most people don't care what is behind the drywall or up in the attic. Nobody cares that they installed R-2 cheap vinyl windows, sliders and double hung to boot, which adds insult to injury since they are notorious for leaking air as compared to casements or tilt & turns. I've learned a lot in the past few years from studying and researching green building methods. I've also learned that not all green building products are really expensive. Pricing and bidding windows was an informative lesson and I learned that you could find great performing windows without having to pay an exorbitant price tag. My choice of Intus Windows was due to the fact that their uPVC line of triple pane windows was the best bang-for-buck out there. When one compared an Intus triple pane window to a (insert mega window manufacturer/big box store window), the choice was clear. Operate a European tilt & turn window and it's like a bank vault door when it closes. The same cannot be said for the cheap and inefficient windows found in 95% of homes out there. People would rather pay money for overpriced granite tops than better wall and roof insulation or better windows. Hopefully people study up and get educated that building green is better for the planet and homeowner, as they don't have to spend high utility bills while living in the home for the next 10-20-30+ years. Plus the comfort level of a green home is just icing on the cake. I think choosing.... Can be granite and green not either or. Granite.... The Adirondacks .... Granite... Is the nature of our local nature. Also Peter who do you recommend I go to in my area for supplying Intus? As usual, your writing could use some punctuation. But I think you are telling us that granite for kitchen countertops can be sourced from the Adirondack region of New York state. Is that really true? A lot of the granite sold by U.S. distributors actually comes from Brazil and India. I used to get my marble for marble countertops at the Vermont Marble Company in Proctor. But the quarry closed. Of course, there are still granite quarries in Barre, Vermont. But most of the Barre granite goes for tombstones, as far as I know. We have a number of "local" granite suppliers here in Maine. In most cases, they will have 2 or 3 true local granites to choose from, and many foreign granites, all being sold right along side one another. Even if you send a homeowner/ client there to pick out a local granite, they might come away choosing another. Granite counter tops often get a bad rap. Sometimes great deals can be found here in New England, small runs for $40/ sq.ft but other times, They are above $95/ sq.ft. (with fancy edges, and super glossy probably). In other parts of the country, I think they have less availability to the local sourced stone. Again, research, shopping, and creativity comes into play. I recently did a restaurant with recycled maple bowling lanes turned into tables and counters. 3" deep maple! One of those 'right place, right time' deals. The truth is that we have more houses with basements than we do on slabs. You're right, it is just the reality of the site that will dictate, and the sloped ones, although harder to develop on, are often less costly at first. We still debate our insulation details with builders for foundation walls (interior? exterior? both? roxul/eps/cellulose/spf? ICFs? rim transition? moisture control?) but all slabs are pretty straightforward. Much of where I live only has inches of soil over granite. There is very active stone quarrying. Countertops not so active as far as being mined actively. Ski at Gore Mountain and check out the garnet laced slabs at the upper slopeside lodge fireplace. Granite to me belongs very naturally greenly in building homes on granite mountains. Granite is basic earth. Green as it gets. Okay, so a carport is the most affordable option. But, what if you want a secure and weatherproof place for cars, bikes, extra storage, your drum kit, or your secret stash of GBA Construction Details? Is it cheaper to build separate uninsulated garage structure, or insert garage into your HouseCube (sealed off from rest of house). (One extra detail, I would think it would be "greenest" to not insulate (or very minimally insulate) the exterior garage walls of the cube, but air seal and insulate (like an exterior wall r40) the garage/house "interior" walls.